The issue of 26 defective China-made SMRT trains has been making headlines since 5 July after this was reported by investigative journalism site Factwire. Since then, MOT, LTA and SMRT with the assistance of MSM (not stat board) have continued to issue statements as if social media did not exist: it was right to withhold information of public interest. With PAP’s script in hand, Khaw has an uphill task to do battle with social media and convince the public that the government really had our interests at heart. Khaw is really well known for uttering nonsense; the more ridiculous, the better. To make another lasting impression on idiots, the government has ensured Khaw’s authoritative statement made CNA headline. 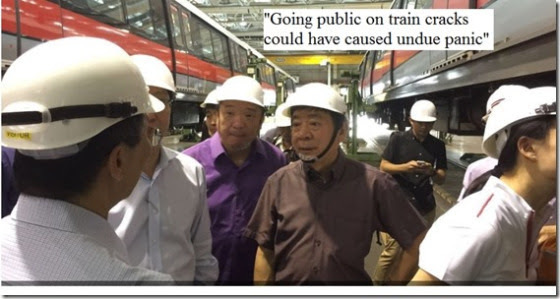 Khaw: “Going public on train cracks could have caused undue panic”. Sure or not? Our systematic train inspections revealed hairline cracks on 26 trains. They pose no safety issue currently. Since they are also under warranty, we will be sending them back to the manufacturer for rectification works. All costs will be borne by the manufacturer. There will be no disruption/delay as our spare capacity is more than sufficient to meet demand. We will keep the public updated on the progress. Would such transparency have caused undue panic? Or led to many commuters switching to a different mode of transport? So what was the real issue which prevented timely disclosure? It appears the government had actually kept this issue under wraps to prevent public perception of SMRT, which was already at an all time low, from falling further. Not only were major disruptions affecting more lines simultaneously, 2 young SMRT employees had died as a result of SMRT safety protocols not being observed. It also didn’t help that CEO Desmond Kuek had roped in his army buddies with ZERO public transportation experience. As to be expected, these highly-paid jokers have yet to resolve chronic problems since Kuek’s incompetent predecessor resigned. Against this backdrop, SMRT wasn’t really certain of how the public would have reacted to its disclosure and had chosen to take the risk of non disclosure. It has now dug itself a deeper grave. Back to Khaw. If one goes by his prevent-undue-panic logic, shouldn’t the NEA keep the 22170 dengue cases 2013 a secret? Khaw should seriously consider advising NEA against keeping the public informed of the rising number of dengue cases for 4 weeks in a row as this may cause undue panic. Or project a historic 30,000 dengue cases this year. But why has there been no undue panic despite the rising number of dengue cases, including 5 deaths? 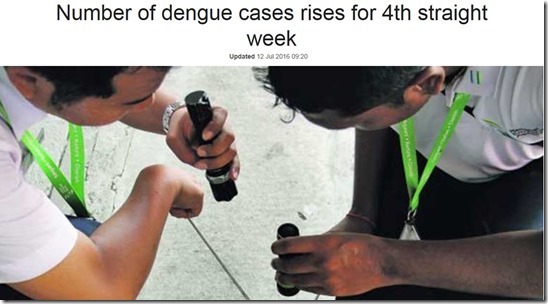 Will NEA’s transparency on dengue cases cause undue panic? A moving system is subject to daily stress and a hairline crack will not remain one forever. If the issue wasn’t safety-critical, there would have been no need for the train manufacturer to incur millions in rectification costs, perhaps even wiping out its profit. Is the Chinese manufacturer plain stupid? Could they not have flown in a couple of their best welders with the best welding equipment and save millions in costs? The government should come clean and stop hiding behind half truths. Perhaps the issue is considered safety-critical only after another accident has happened? Who would have panicked if MOT/LTA/SMRT had been transparent and and disseminated the information in a timely manner? Khaw?